Fishing can be an art on it’s own specially if you look at those fly fishers deal with their lines. 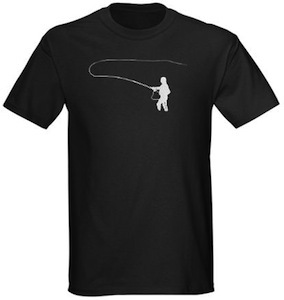 This t-shirt shows the fly fisher at work. Just a fisher and his fishing rod and line ready to concur the stream. If fishing is your thing then maybe you are one of these artists that can make the line fly. And if you are then you deserve a t-shirt like this. You can get this fishing t-shirt in all kind of styles and colors for both men and women so that you can have one for every day of the week. Do you know a true fly fisher that needs a present then you should think of this t-shirt.